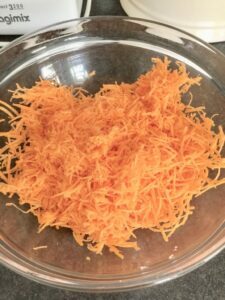 This Easy Grated Carrot Salad is the only raw veggie salad my children will eat and (wait for this) they will even ask for MORE! If that’s not good enough incentive for you to give it a go then I will also add that it is (obviously) really delicious and if you are not a fan of coleslaw type of salads this may be a nice alternative. Maybe you are one of the lucky ones and your children will happily snack on cherry tomatoes and cucumber sticks dipped in hummus at any given opportunity but my kids are not like that. They actually do love hummus of any kind but as far as any raw, salad type vegetables are concerned they consider them to be (and I quote) “disgusting”. I have no idea where I went wrong during weaning years but there is no point to dwell on it now. There is hope for them yet I think but for now I’m simply thrilled that they love this Easy Grated Carrot Salad! This is the salad I pretty much grew up eating and after introducing few little tweaks to my mum’s recipe, this is the version I have been feeding my family. This salad is quite sweet especially if you are using gorgeously and naturally sweet new season carrots or bunched carrots but I always add some more sugar to get it to the flavour I know and remember from my childhood. I would advise you to treat the quantities of the ingredients in this recipe more as a guide and use your own taste to get the flavour and most of all sweetness you will be happy with. This salad is definitely supposed to be sweet but we are all different when it come to our sweetness threshold so taste, taste, taste!!! * food processor to do all the hard work grating but simple box grater would do an excellent job too. Use fine to medium side (not the coarse one) as that would completely change the texture of the salad and it wouldn’t be the same. What you want is almost angel hair like carrot strands. This salad will go marvellously with my Easy One-Pan Salmon & New Potatoes Bake and also this Roast Chicken with Wild Garlic Pesto & Shallots and these Mini Pork Meatloaves with Courgette. Super simple, super versatile and oh so tasty! Perfect accompaniment to variety of meals. Loved by all including the kids. Peel the carrots and grate them on a fine to medium side of your grater. You want nice and fine strands of carrots. Set aside. 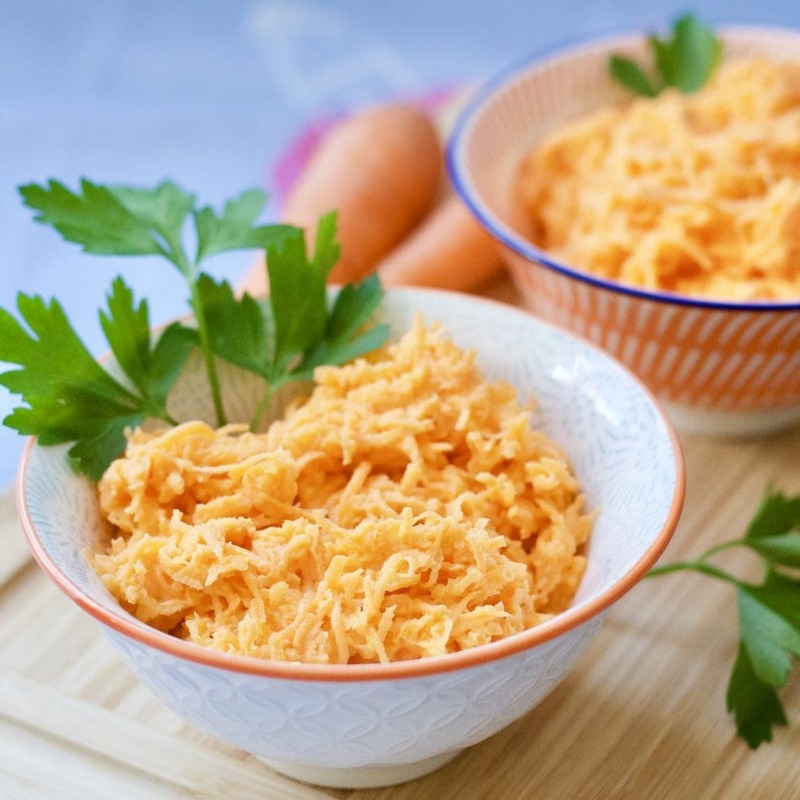 In a small bowl mix together creme fraiche, cider vinegar and sugar and pour the mixture over grated carrots. Give the salad a good mix with a spoon tasting as you go. Don't be afraid to add more sugar or vinegar if you think it needs it to suit your taste. Serve and enjoy! Feel free to use honey instead of sugar if you prefer however bare in mind that the flavour will be slightly different. Single cream or full fat yogurt could be used instead of creme fraiche. Calories are approximate and as guideline only. Yumm! So simple yet so delicious! Oh, my gosh—I grew up on a salad like this too! Except that my mom’s involved an obscene amount of mayonnaise, which kind of killed it for me. Yours with the creme fraiche sounds SO much better. And thank you, because my kids are NOT the cherry tomato and cucumber-eating types! This salad is such a blast from the past for me Michelle, you have no idea and am so pleased my kids like it as much as I do! My mum used to make it with way more sugar than I do and proper full fat cream – it tasted lovely back then and nobody thought twice before scoffing it all but this lighter version is really delicious too! Oh, my children love this salad too, I add apple to mine and make it dairy free. Thank you for bringing your tasty recipe to #CookBlogShare! This is exactly my type of salad! We mostly eat raw salads during the week. 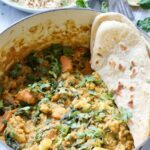 for supper with a bowl of lentil soup or curry. We do love it too Balvinder plus good thing about this one is that it’s so refreshing especially when chilled so perfect in this hot weather we’ve been having here in the UK. I wish my children would eat a carrot salad like this! Master Spice likes carrots but they have to be roasted otherwise he won’t touch them and Little Miss Spice will only eat tomatoes where vegetables are concerned. I can just imagine this salad going brilliantly as a bbq side dish right now and of course it would be great the next day too so thanks for sharing with #CookOnceEatTwice!